There is no doubt the final play of Sunday's game between the Patriots and Dolphins will remain embedded in the minds of Patriots fans and pundits for the next several days. Probably weeks. Maybe even longer depending on how the playoff picture shakes out in the AFC. It was a failure on multiple levels, from the personnel deployed for the play to the execution of the play itself. The question is, for this exercise, how do you grade that? Is it as simple as handing out Fs across the board for the defense? Every week the goal here is to take the entirety of the game into account and assess each position group's performance. So while the Miami Miracle will factor in, it won't be the only thing that factors in. Especially since that play wasn't the only play that lost the game for the Patriots, making them 1-5 in their last six in south Florida. This was a tremendous performance from Tom Brady, marred by one sequence at the end of the first half. At least he copped to it at his postgame press conference. He simply forgot that the Patriots were without timeouts when he took a third-down sack in the shadow of the Dolphins end zone as time expired in the second quarter. That wiped three points off the board and was the rare gaffe that would on its own drop a grade a half-letter. On the play before the sack, Brady bailed early on his throw, missing a wide open Chris Hogan for a touchdown. There were other miscues -- Brady had plenty of time and was nearly picked early in the second quarter; he overthrew Patterson on a corner route; he missed Rex Burkhead in the flat on third-and-nine in the fourth -- but for the most part he was as on-point as he's been this season. His slants to Josh Gordon allowed the receiver to accelerate and power ahead for additional yardage on multiple occasions. His "whip" route throw to Julian Edelman was on the money, and his 37-yard touchdown throw to Patterson's fingertips was one of his best of the year -- particularly since he was looking elsewhere, looking off the safety in the process, and came back to his teammate "The Experiment." Brady's ability to recognize Gordon beat his man down the sideline, and his ability to put a pass on Gordon from distance to help draw a pass-interference penalty, should have been a game-ender. Not since a 43-point outing against the Chiefs had Brady been so effective through the air. Patriots running backs barely made a peep in the first half. Things picked up for them early in the third when Sony Michel used a stiff-arm to create some yardage on his own for seven yards. Four plays later, Michel ran for nine yards on a nice counter-action run. Otherwise? Hard to find much to get excited about from this group. And given the Dolphins were one of the league's worst run defenses coming into the game, that qualifies as a serious letdown. Part of the reason for the low output (2.6 yards per carry) was because of the blocking (which we'll get to), but extra yards created by Patriots backs were few and far between. Michel ran into Brady on a miscommunication at the end of the team's first drive of the game. He had nine carries of two yards or fewer and six carries of more than three yards. Burkhead couldn't make anyone miss with his first touch in the flat, and he was later stuffed in the second quarter on a second-and-10 play when it seemed like he hesitated to get to the line of scrimmage. Even James White couldn't do much with his touches, picking up 13 yards on four carries and 15 yards on two catches. Julian Edelman struggled with an apparent foot issue and was largely held in check by the Vikings last week, but the warm weather in Miami seemed to do him some good. Targeted 12 times, Edelman caught nine for 86 yards and a touchdown. He did drop a pair of passes but six of his receptions went for first downs. Gordon continues to impress on quick-hitting plays thanks to his acceleration to be able to out-run defenders in short spaces and his hard-nosed run-after-catch approach. Gordon also remained one of the team's most sure-handed players, catching passes in traffic and taking big shots after the catch yet holding on. Gordon also helped break up a near interception in the third quarter. His ability to beat Minkah Fitzpatrick down the sideline helped draw the would-be game-winning pass-interference call the Patriots picked up on their final drive. Despite Patterson's nice touchdown grab, he whiffed on a block to get a Michel run stuffed on third down in the first quarter. He lost another block on the first play of the second quarter that blew up Edelman's end-around "reception" off a flick from Brady. After one of his worst games in a long time, Rob Gronkowski bounced back in a big way. He caught all eight of his targets for 107 yards, including 29 yards after the catch, and a lunging contested touchdown grab. His outing may have been the biggest positive takeaway from the game for the Patriots. Through the first half, Gronkowski had much of his success against linebackers, but by game's end he'd beaten corners Bobby McCain and Torry McTyer and safety T.J. McDonald as well. Gronkowski played as well as he did -- at one point in the third showing he's still willing to run over defensive backs -- despite taking a huge shot to the back at the end of the first half during his leaping catch over the middle. James Develin scored again but was one of the reasons for why the running game never really took off. He whiffed on a block early, keeping a Michel run to only three yards. He had a similar mistake on the second play of the second half for the Patriots offense. His holding penalty on New England's final drive was a killer, and it may have been a sign of some fatigue. He wasn't able to clear much room on either of Michel's final two runs of the game (two yards total). Against a Dolphins run defense that was allowing 5.0 yards per carry going into the game, to come out and run it the way the Patriots did is a reflection on the Patriots offensive line. They did all they could two weeks ago to establish some toughness running the football. But try as they did, they found little success. They were stuffed on third-and-one in the first quarter. They got zero push on a second-quarter play when Joe Thuney pulled, leading to no gain for Burkhead. Shaq Mason pushed a defender into Michel to limit the back to three yards later in the second. Trent Brown had consistent difficulties in the running game, and it's worth wondering how he was feeling after he briefly made his way to the blue medical tent on the Patriots sidelines for some type of treatment. Marcus Cannon was flagged for a false start penalty late in the third quarter on a drive when the Patriots were eventually forced to punt. Brady was sacked twice -- once at the end of the first half and once by Bobby McCain on a corner blitz that no one had picked up. The first was on both the quarterback (he had time to throw it away) and his line, which was swarmed under. The second? No one had it picked up so it's hard to know whether the blame should be on the quarterback for not understanding there was a rusher who hadn't been accounted for, or on the line for not adjusting on the fly to thwart it. Either way, Dante Scarnecchia's group has seen better days. This grade might've ended up in the 'A' range had it not been for Stephen Gostkowski's two missed kicks. On both the point-after attempt that failed and the 42-yarder that sailed wide right, Gotskowski's kick faded on him. Though there was some rain during pregame, and though the turf was a mess in spots, the footing seemed sound on both attempts. Other kicking-game miscues included Patterson returning a kick from the back end line to the 21-yard line, and a neutral zone infraction on Adam Butler. 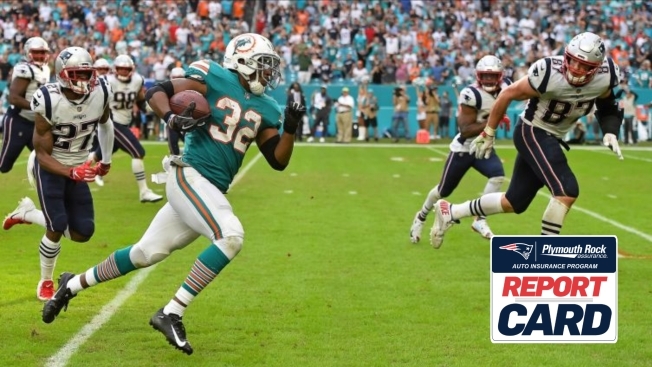 On the positive end of things, Ryan Allen pinned the Dolphins down at their own eight on one of his three boots, and Patterson forced a fumble on one Danny Amendola punt return. Albert McClellan, meanwhile, was the star of the show. His two punt blocks were mini-clinics in how to quickly and legally get to the punter's leg. It helped that the Dolphins did very little to stop him on his way through the line. Credit Nate Ebner's rushes from his off-the-line spot for potentially confusing the protection and allowing McClellan to get through. This is another difficult one to pin down. On the one hand, the Patriots allowed a whopping 9.0 yards per carry. On the other, the Patriots picked up two sacks, three hits and four hurries off of pressure from the defensive line. In the end, what Trey Flowers (credited with both sacks, although one came as a result of Ryan Tannehill stepping on the foot of one of his offensive linemen) and his teammates up front did in the passing game was not enough to offset some of the chunk gains picked up by the Dolphins on the ground. And, yes, that's not all on the linemen. Linebackers were part of the problem as well. But on Brandon Bolden's 54-yard run, Lawrence Guy (perhaps the team's best run defender) was cracked by a tight end. On Frank Gore's 36-yarder, Flowers and Malcom Brown were blown nearly three yards off the line of scrimmage. The Patriots relied on heavier sets as the game went on -- Deatrich Wise and Brown combined to stuff Gore late in the second quarter; Adrian Clayborn stuffed a Kenyan Drake run; Adam Butler recorded a tackle for a loss early in the third to help force a punt -- but the damage had already been done. When it came to the success of the Dolphins running game, the Patriots linebacker group was certainly responsible for their share of the damage. Kyle Van Noy, Elandon Roberts and Dont'a Hightower were all blocked one-on-one on Bolden's long touchdown. Roberts was late getting to the party on Gore's 36-yard run, and Hightower bit hard on Tannehill's fake to Gore for a 13-yard keeper. On Gore's 16-yard run in the third quarter, Ramon Humber screamed into the wrong hole from off the line of scrimmage, Brown was blocked, and Gore was off into the secondary. One play later, Roberts fell in coverage and allowed an extra 25 yards to Gore after a simple pitch and catch to the flat. It wasn't all bad. Van Noy had yet another strong week. He combined with Hightower to pick up an early pressure that forced an incompletion, he stuffed a late Gore run by blasting a blocker back into the runner, and he combined with Jonathan Jones for a sack out of the team's Amoeba Front. John Simon continues to produce with limited snaps, picking up a sack and two hurries on just 16 snaps. What happened on the last play falls in large part on this group's shoulders. Stephon Gilmore, J.C. Jackson, Jason McCourty, Duron Harmon, Jonathan Jones and Patrick Chung were all out there for the miracle play. Before that, though, the coverage was not up to this unit's typical standards. Jason McCourty allowed all four of the targets sent his way (all to Kenny Stills) to be caught for 81 yards and a touchdown. Stephon Gilmore broke up a pass, but he was also on the scene for a Brice Butler 23-yard score. Ryan Tannehill dropped back to pass just 23 times in the game. The Patriots got pressure on him 10 times. Yet he still ended up with a near-perfect passer rating (155.2), completing 14 of his 19 attempts for 265 yards and three touchdowns. The secondary didn't have as many opportunities as they normally might to impact the game, but there were enough. Even against the run, they weren't their sure-tackling selves. Duron Harmon seemed to be too aggressive in his angle to the line of scrimmage on Bolden's long touchdown. On the shorter Bolden score, Patriots defensive backs were late to try to tackle him near the goal line. All in all, a day this group will want to forget as quickly as possible.